Getting an Award is like getting recognition for your hard work & knowing that there're people who appreciates what you write! These blogger awards are passed on over & over again in the bloggersphere to express support & appreciation for one another. 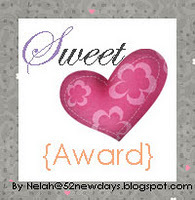 I was bestowed with these 3 Awards, shortly after receiving the Versatile Blogger & Cherry On Top Awards. My sincere apology for the late post as I've been kept busy. So who's this blogger with a big heart, who'd bequeathed all 3 Awards to me at one go & also tagged me in a game at her recent post? Attached is the photo, I hope I did justice to your precious recipe. It's a staple to my cookbook now, and I am so happy I came across your blog. Will try some of your other recipes in the near future!" Well, I'm glad that some of my readers here are also following Wi now after my last introduction to her blog. 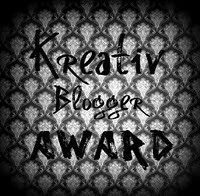 That's the best part about blogger awards, they let you share your fave bloggers to your readers :) Thanks again Wi, for presenting me the Sweet Award, Kreativ Blogger Award & Tell Me About Yourself Award! 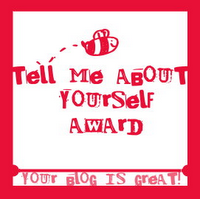 Now, I'm supposed to tell my readers 7 things about myself for the Tell Me About Yourself Award; & write a note with four things per question for the Tagging Game. I'll cut the formality & you can read all about it at my previous post @ Awards & Architectural Wonders Of Helsink! or if you like to know more about me, here's An Interview By Pepperconn Social Media 101. Wi, thank you again for the Awards! If you're not acquainted with this vivacious gal, you'll certainly be taken in by her friendly personality. Those awards are so sweet. Glad that you received those awards. Congratulations on your awards, Shirley! Definitely well deserved. 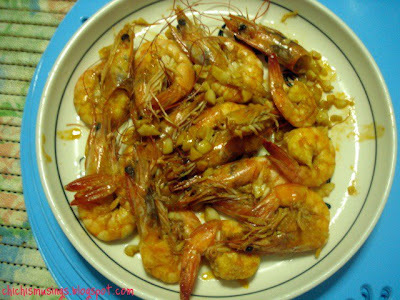 Oooh garlic prawns! You know I'd eat that whole plate if left unguarded in front of me :D. Keep up the great blogging, my dear! Lequan, thks dear! Would love to have u try out my recipe too. Thks for taking d time to drop time all my posts! U're the best! Congrats so much Shirley on all the awards and yes, people appreciate what you write and share. Ooopps... And Congratulations on your well deserved awards. Life has been pretty hectic around here. Things are getting tough especially year end. Hope everythng is well on your side. Happy thanksgiving to you & your family. Enjoy & have loads of fun. Shirley, your plate of garlic prawns makes me drool and I agree with you Wi is indeed a very supportive blogger friend and so are you. Congrats on the well deserved award. Did you see the post I dedicated to you. If not, hop over now and you will see something that you LOVE! Hugs. Aemy, hope more awards will come to you soon! Nava, thks for the encouraging words! Taj, thks for the kind words! Anu, thks again! Enjoy your weekend! You totally deserve it dear! Congrats! Tina, u're sweet too! Thks for your lovely comments! Charmaine, I'm glad we've met! Wi, thks again for the support & awards! It's great being friends with a charming gal like u :) Happy cooking! Biren, thks dear! U enjoy your weekend too! hahas nowadays people tag awards alot :) glad that u won them ! Honestly I fancy those garlic prawns myself. Fish, it's been popular for quite a while. Really nice to receive them :) Thks, dear! Francesca, thks! Will follow u too!